WE BRING YOUR EVENT TO LIFE! View our brand new event space. View our off-site catering packages. We’ll make your special day perfect! SCHEDULE A FREE CONSULTATION TODAY WITH OUR EVENT PLANNERS. Larry and his team were absolutely amazing to work with, from start to finish! My husband and I got married on 6/4/2016 and Larry started working with us a year prior in the Summer of 2015. He was the most responsive and dedicated vendor we worked with. We had a complicated ‘do-it-yourself’ wedding that had multiple locations for cocktail hour and the reception. Larry helped with our decision making and organizing throughout the whole planning process. His team made our whole ‘complicated’ wedding completely seamless. The waitstaff and bartenders were wonderful and everyone raved all night about the cocktail hour appetizers and reception entrees! It was the best food I have ever had at a wedding. Constantino’s provided all the linens, silverware, etc. and rentals of tents/chairs/tables were all organized through them, rather than having to deal with another vendor. We appreciate everything you did for us to make our day absolutely perfect! We can’t thank you enough! We HIGHLY recommend them to everyone for their special events! One of the best caterers in Northeast PA! Not only does Constantinos offer up delicious food and amazing displays, but their customer service is top notch! As a vendor, I have seen Constantinos ‘behind the scenes’. As professional as they are up front, serving at weddings and events, they are just as professional and committed to quality and service behind the scenes. From the kitchen to the table quality and service are consistent. They treat their vendors and clients well. Hire Constantinos for your next event, you will not be disappointed! We used their new venue in Clarks Summit, PA for my wife’s surprise birthday party. From the very beginning they were exceptionally professional and went above and beyond to help in anyway. The planning was made so much easier by the constant contact and timely manner at which everything was handled. The only words to describe the venue and food is just perfect. We had the BBQ, which was cooked on site outside on the grill, and it was by far the best food you can get at any venue around the NEPA area. The staff was also amazingly friendly and as the night went on there was not a single piece of trash or empty plate laying around anywhere. They stayed on top of everything perfectly. I will recommend this place to anyone and everyone!!!!! Words cannot express how wonderful this group is! Larry and his crew made my daughters dream come true, from the set up, linens to the amazing food! If you have any occasion coming up these are your people they do not disappoint! Thanks Larry and crew for an awesome wedding! I have never heard so many people rave about ‘wedding food.’ Larry’s staff run like a well oiled machine. My other vendors assured me I was in good hands and they were absolutely right. The room looked beautiful, the staff were friendly and accommodating, and everything was delicious! 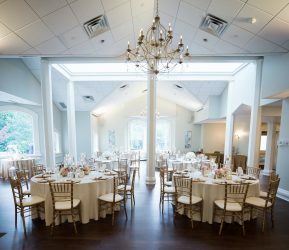 And I’m also aware (from an inside source) that my wedding venue is thrilled when their couples choose Constantino’s, since they do such a thorough clean up job. Thank you all so very much for contributing to my perfect day! My experience with constantinos was nothing less than perfect right from the beginning. Larry and his staff are so kind and professional. 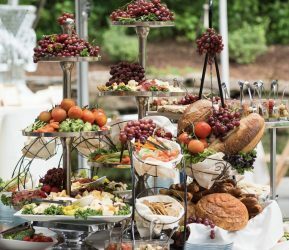 They recently catered my wedding and it was absolutely wonderful. The food was incredible and the presentation was gorgeous. The man who was in charge of my event was awesome. Anything i asked him to do he did without a question. Everyone at the wedding couldn’t get over how good the food was. I can’t say enough good things about this company. I would highly recommended Constantinos to anyone and everyone! Our daughter’s wedding was on 9/4/16. Constantino’s helped to make it a great day! They were with us from start to finish, were very responsive to our needs, and kept things running smoothly throughout the festivities. Most importantly, the food was delicious. We had a sit down meal (at an outdoor wedding) and regardless of the meal choice, everyone was complimentary. The wait staff was wonderful and friendly. Thank you, Constantino’s, for making the day perfect! Constantino’s provided us with the best wedding package we could have ever asked for. Everything was perfect. The food was to die for. The servers and bartenders went above and beyond and were very professional and courteous. The reception space looked amazing with the tabletops. Everything was perfect. Constantinos was so easy to work with the entire time. We can’t thank you enough! Constantinos went above & beyond our expectations for our wedding. Larry & Alicia were so helpful throughout the entire planning process. Alicia made everything run smoothly the day of our event, it was all SO easy! The amount of compliments we received on the food was phenomenal. Our guests were extremely pleased. The display of food and bar services was beautiful. The staff was kind and professional all day long. We are lucky to have had such an amazing catering experience, I would recommend Constantinos to anyone! Thank you all! We used Constantino’s for our wedding at The Barn at Glistening Pond. We were going to interview several caterers but when we sat down with Larry we knew we were with a competent professional. Soup to Nuts and beyond – you can’t miss a detail because they will remind you!!! AND the food, the food . . . really, the food . . . I cannot say enough about the food. We had several “foodies” in our group and when they went back for seconds, asked for a recipe and raved about the quality, I knew we had made the best decision. Great servers, ABUNDANT appetizers. Larry is a pro and you will not be disappointed. Worth EVERY cent! We used Contantinos for our wedding on a private property and they handled everything seamlessly! They did our food, rentals, and planning and went above and beyond in so many ways to make our wedding perfect. The food was fantastic and both Larry and Kelly made sure that our vision came together on the day of exactly how we imagined. Our wedding was a true fairytale thanks to Constantinos. Kelly, Larry, and the entire staff went truly above and beyond to make our special day perfect! You all are such a joy to work with and I’m so sad it’s over. Thank you for taking care of EVERYTHING!! Amazing job!! One of the first decisions I made was to book Constantino’s for my wedding day, having heard rave reviews from friends as well as from my venue. Larry and Alicia were beyond amazing, working with me while I planned my wedding out of town and accommodating with my schedule while I was in town. They made sure everything went smoothly, not only with our food (which was delicious), but with working with the other vendors to ensure a perfect day. I highly recommend them for any event! Thank you Larry, Alicia, and the Constantino’s team for everything, I really could not have imagined it any better. The best around! Kelly and Larry are a dream team to work with. They go above and beyond to help their clients and I can’t say enough good things about them. The food is outstanding and they will ensure your wedding or event is everything you want and more. Thanks for everything guys! We had our wedding in October, and everything was perfect. Having them coordinate the ceremony made everything so easy. The day of, we stayed there all day from getting ready in the beautifully decorated bridal suite until the end of the reception. The staff were so tentative to us throughout the day making sure we had everything we needed, the ceremony and reception spaces were set up perfectly, the entire day was coordinated by them and I did not have to worry about anything. And of course, the food was delicious! The late night pizza really hit the spot! Thank you so much for helping to make our wedding day spectacular! Stop your catering search now and go with Constantinos! Everything from the moment we walked in to consult with them was absolutely amazing. There isn’t enough space to tell you just how great Larry, Kelly, and the entire staff are when it comes to the catering business. We had constant contact with Kelly, a wedding planner through the company, and she was great! She is incredibly detailed oriented and made a ton of suggestions and tweaks to make our day a dream come true. We were able to sample a ton of food before we made our final selections. We had an antipasto station, 4 passed apps, a pasta station, and a carving station that included beef tenderloin and bourbon glazed salmon. EVERYTHING TASTED AMAZING! The staff that worked our wedding was great! They were very personable and extremely professional. Overtime if a candle blew out, someone was there to relight it. It was the little attention to detail from the entire staff that really made them stand out. We would not have changed a single thing about our day and we owe Constantinos for a lot of that! Hiring Larry and the team at Constantinos to cater our reception at the Scranton Cultural Center was one of our best decisions of the day. From initial contact the team was incredibly responsive, helpful and knowledgeable. The food was phenomenal and 2 weeks later my husband and I are still hearing about how wonderful all of it was. The linens and glassware provided through Constantinos were stunning and the cocktail hour set up was beautiful! We loved working with Constantino’s and highly recommend them! We could not be happier with Constantinos! 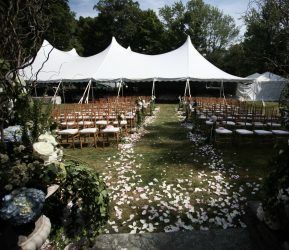 We met with Larry who recommended several venues including the one we fell in love with (The Barn at Glistening Pond). Larry was so helpful from the very first step, and really put our planning at ease because he has done so many weddings and is very organized with every detail. The food was absolutely delicious! Our guests raved about the food and some people even said they went back for seconds and thirds. The only complaint that I have is that I missed the cocktail hour (due to taking pictures) so I couldn’t try the hors d’oeuvres but I heard they were out of this world! Larry and his team were the definition of professionalism. The food was absolutely fantastic and staff was friendly and accommodating. They had our venue set two days in advance so the day of the wedding was completely stress-free. The team even started dinner fifteen minutes earlier than planned so we could get to the party, which they knew was a priority for us. Larry worked with us to make sure our package included everything we needed for a great value. After our first meeting with Larry, we knew we were in great hands and ensured that everything for our day was PERFECT! Amazing! Constantino’s helped make our backyard wedding perfect! Wait staff arrived early, helped with finishing touches without even being asked, and were so incredibly sweet! All our guests raved about the food. Would use them again and again! Thank you so much for helping make our special day so wonderful!